Erman Imayhan, born in Istanbul, began his cello education in 1994 at Mimar Sinan Fine Arts University State Conservatory under supervision of instructor Prof. Resit Erzin. He first got on the stage in 1996 at Ataturk Cultural Center under “Istanbul State Symphony Orchestra Association Concerts” organization. Mr. Imayhan, who received an award at Cello Contest, organized by ANACEV (Anatolian Contemporary Education Foundation) in 1999 at Bilkent University, participated in Istanbul Fest organization in 2000 – 2001 Season. He attended the Mediterranean Youth Orchestra in 2002 – 2003 as the Conductor of Cello Group and was invited to the Mediterranean Youth Festival organized in Corsica the same season. Imayhan, who performed the solo suits of J.S.BACH in St. Esprit Cathedral in Istanbul, also gave solo concerts with Istanbul State Symphony Orchestra, Anatolian symphony orchestra, Eskisehir Metropolitan Municipality Symphony Orchestra, Filarmonia Istanbul, Bad Reichenhall (munich) Philharmonic Orchestra, Izmir State symphony orchestra, Istanbul Chamber orchestra, Camerata Saygun Ensemble, Camerata Baroc Istanbul Ensemble. In 2004, he was qualified in the “Shining Stars” contest organized by Is Sanat and got on the stage at 2009 Istanbul International Music Festival , Izmir International music festival, Antalya International Music Festival as well as performed solo and chamber music concerts at Istanbul Ataturk Cultural Center, Is Sanat concert hall, Ak Sanat hall, Sureyya Opera house and Izmir Sanat (at Izmir Festival). He performed solo concerts with leading conductors like Ibrahim Yazici, Hakan Sensoy, Burak Tuzun, Emin Guven Yaslicam, and Christoph Adt . He graduated in 2003 and completed his Master Degree in Istanbul at 2006 with Prof. Resit ERZIN. In addition to the academic postgraduate classes attended, he also had the opportunity to study with respected cellist like Yo-Yo Ma, Antonio Meneses, Alexander Rudin, and Joel Krosnick. He currently performs at Borusan Istanbul Philharmonic Orchestra and performs as a solo cellist in Borusan Virtuosi. 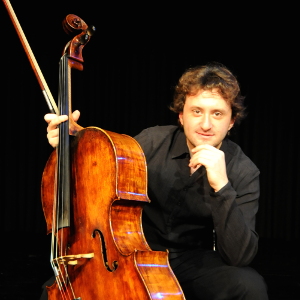 Erman Imayhan has a master degree from München Hochschule für Musik und Theater and also has been continuing his solo performances with the respected cellist Natalia GUTMAN at Scuola di Musica di Fiesole since 2011 and he is teaching at Mimar Sinan Istanbul Fine Arts University State Conservatory’s cello department as an instructor since 2007. His cello made in Ancona 1845 by Joseph Baldantoni which was given by the same institution.